This year, as many as 7.8 million people – more than half of Niger’s total population – face the grim prospect of months without sufficient food. Sporadic rains during the last growing season have had a devastating effect on harvests and food supplies, leaving households with little to save for the long “hungry season” between harvests. There are already widespread reports of families – particularly women and children – skipping meals and having to forage for semi-edible grasses, leaves and other wild food. They need help to survive until the fall harvest, and the Government of Niger has requested urgent assistance from the international community. 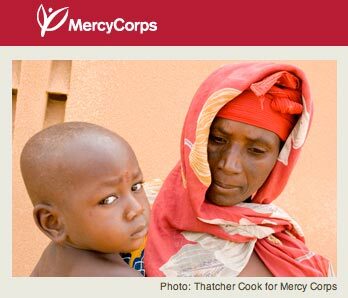 Mercy Corps – which has worked in some of Niger’s poorest villages since 2005 – has plans to deliver food and other critical assistance to more than 211,000 people threatened by the hunger crisis. Through government grants, private support and partnerships with local organizations, Mercy Corps will supply nutritious food to vulnerable households, in addition to supporting community banks and early warning response mechanisms.